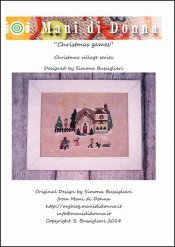 Christmas Games [H6324] - $11.00 : Yarn Tree, Your wholesale source for cross stitch supplies. Cross Stitch pattern from Mani di Donna. Christmas is a great time to get together with family & celebrate! This designs shows the family outside playing! They are decorating a tree & playing with the dog. The home that stands behind them is decorated for Christmas with a Christmas wreath & garland. Snow is blanketing the ground. Stitched on #8291 Belfast Linen Light Mocha 32ct. Stitch count is 99w x 83h.